Cougar Cub Challenge a Great Success! Click here for more info. Mahalo for your help in support of our children and the Friends of Kamiloiki PTO. Together, we raised $13,906.50 to continue supporting our teachers and programs. Mahalo, also, to our great parent volunteers and PTO. KEIKI RAINBOW RUN EARLY BIRD REGISTRATION by Feb. 22! Register by Friday, February 22 and 100% of your $15 fee will come back to our school to support our PE program! Click here to register! 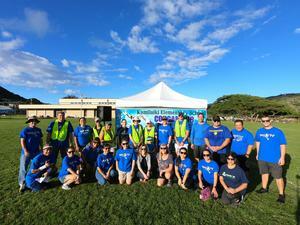 Keiki Great Aloha Run: ONLY 2 More Days to Register! Support our school's PE program by registering for some Great Aloha family fun! Looking for a great after school program to enhance your child's learning options? Campus Beautification, Saturday, Jan. 19 & 26: Got Paint? If you've got mad painting skills, we need your help! Campus Beautification will take place on two days: Saturday, Jan. 19 & 26, 9 am to 1 pm. Parents to help repaint the blue walls and students to paint our blah-looking cement benches. This is a Friends of Kamiloiki PTO-sponsored event! Calling All Parents: Make a Change, Make a Difference! A New Year brings new opportunities for making positive changes for our school. Getting involved in your child's education may mean more positive educational outcomes in their future! So what's happening? Click here for more info! 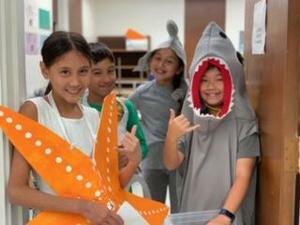 A quick Fall Break led into a burst of busy during the prep for Keiki Carnival. Crazy fun followed by Boss' Day (pic at left), KHON2 newscasters, and more! Students in grades K - 5 expressed their ideas about our school's vision and mission statements during their library time with our school librarian. They were asked to either write or depict their ideas onto small, colorful sticky notes, visually creating a colorful voice collective.